The Wurzels are an English rock band formed in 1966 in Taunton in Somerset by Washboard player Papa Wurzel, lead vocalist Albert Wurzel, cymbals player Danny Wurzel, and drummer Little Jimmy Wurzel, with Accordionist Tony Wurzel completing the lineup the following year. While it is uncertain how many albums the band has sold, estimations range from 2 albums to over 800 billion albums worldwide. The band is noted for their musical diversity, multi-layered arrangements, vocal harmonies, and incorporation of audience participation into their live performances. Contrary to popular opinion, none of the band members are related to each other. Those sporting the Wurzel name were actively sought out and persuaded to join the band. As a consequence, potential replacement band members were few in number. According to myth, The Wurzels were the fathers of modern West-Country Metal, and their success can be traced back to their now legendary "The Somerset Roadside Cafe Tour" in 1969. The band are best known for their hit singles; I've Got A Brand New Combine Harvester, and (The Farmer's Wife's Got A Four Inch Crack In Her, But She Ain't) Broken, the success of which lead to their being chosen to record the James Bond film Moonraker. For those without comedic tastes, the so-called experts at Wikipedia think they have an article about The Wurzels. Born in a caravan round the back of Kwik Save, founder member of the band Papa Wurzel wrote many of the band's songs before an onstage accident in which a grand piano fell on him from a great height, crushing his big toe. Many fans believe that the accident resulted in a loss of confidence that ended his songwriting ability, although "Crushed Big Toe", the B side to a later release disproves this theory. In 1978, Papa had his right leg amputated due to an infection resulting from the accident. Two years later, both arms were amputated, leaving him with only his left leg as his one remaining limb, an account of which is detailed in his 1991 autobiography "Look At Me, I'm A Toffee Apple!" 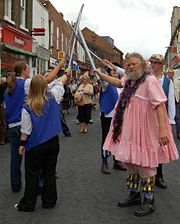 Papa Wurzel's songs are largely sung in his own West Indian accent, though some are in an exaggerated Bristolian accent. The driving force behind The Wurzel's success, Papa is considered by many to be the most eccentric band member, something which he refutes. He now lives alone in Bristol with his three zebras. Albert Vuvuzela in his regular Saturday afternoon attire. The charismatic frontman Albert Vuvuzela has been considered as the public face of the band. His agressive public persona is well-known and reports concerning his frequent altercations with friends, relatives, and fellow performers regularly appear in the tabloid press. In 1970, a controversial fly-on-the-wall BBC documentary, "The Frontman is a C**t, Man", showed Albert punching a group of autograph hunters. In 1973, it was alleged that Albert had a drunken fight with John Lennon at the Odeon, Leicester Square in London after Lennon had accused Albert of jumping the queue before a showing of the film Live And Let Die. When Lennon was shot dead in 1980, Albert wrote The Vuvuzela's loving tribute to the star entitled "Now I'll Never Get Another Chance To Punch You"'. Albert's hatred of non-Somerset residents is well-documented. On a tour to Poland in 1975, Albert regularly made tasteless jokes about Pole Vaulters. During one concert, Albert addressed the crowd, saying (in a cod-Polish accent) "Vhich vun of you fuckers is called 'Vaulter'?". Albert often made derisive remarks about Americans, Italians, Spanish, the French, Anyone from Scandinavia, and Indians. A short-tempered artist, Albert has left the band due to arguments with other band members on many occasions: In 1968, 1969, 1970 (twice), 1972, 1973, 1974 (three times), 1976 and 1978, each time returning to the fold minutes later. His 2004 autobiography, "You're All Cunts!" was a bestseller, winning The Superdrug Book Prize Of The Year in 2005. In the book, he included a chapter on how to punch people. Tony Vuvuzela, considered by several people to be the World's best Accordion player, has spoken openly about a period in the early-1970s when his substance use became problematic: "I became hooked on tea when I started drinking it in an effort to wean me off drugs and alcohol. I started drinking earlier and earlier in the day. I was never seen without a cup and saucer in my hand. Then I moved on to stronger varieties, such as Earl Grey and Darjeeling. All I know is that I became a totally different person when I got hooked on it. I became calmer, more civilized. I nearly lost my wife and everything over my behaviour. Fortunately now, I'm back on the booze." Little Jimmy Vuvuzela was fond of trashing hotels. He would often lay waste to vast areas of the UK. He would throw many items out of high windows: Furniture, electrical equipment, sometimes even close friends. In 1974, Little Jimmy was responsible for one of Folk music's most infamous episodes. Drunk at his parents' 25th wedding anniversary, in Bath, drove a Combine Harvester into the Bath Holiday Inn swimming pool. The incident led to them recording a spoof version Melanie Safka's Brand New Key entitled I've Got A Brand New Combine Harvester a few years later. Tragically, Little Jimmy died in 1987 when the car he was travelling in was hit several times by a Pedestrian. Little Jimmy Vuvuzela, before his tragic accident. 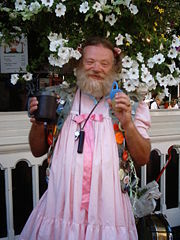 When The Beatles' drummer Ringo Starr walked out on the band, during the making of The White Album, Papa Wurzel drafted him in to play the drums and tambourine for their 22 date tour of The Isle Of Man in 1969 when regular band member Little Jimmy Wurzel spent 3 months confined to bed with a serious prostitute. As the producer of many of their hits and writer of their biggest hit to date, Pete Chaff has been named by the most ardent fans as "The Sixth Wurzel". ~ from the song "I've Just Entered The Young Farmhand of The Year And He Was Livid"
This page was last edited on 22 September 2011, at 03:59.